Just as governments are cutting back on issuing new debt, the corporate sector has taken up the role of being the largest source of new debt in the United States. 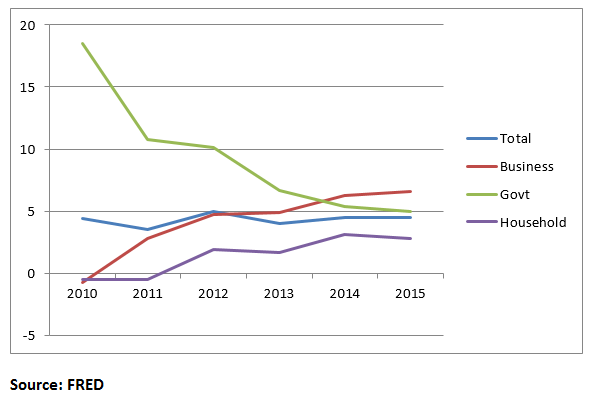 This shift in debt issuance is readily apparent in Chart 1. Since the crisis of 2008, the growth in government debt has dramatically decreased from nearly 20 per cent annually to less than 5 per cent, more in line with the nominal growth in the economy. Consumers continue to remain wary of increasing their debt load . On the other hand, the corporate bond market has been on a bit of a tear in recent years .That segment of the debt market now outpaces all other debt issuers. The U.S. corporate bond market is valued at nearly US $9 trillion; by comparison, it is larger than the GDP of Germany, France and the U.K. combined. No longer are governments the leaders in generating new debt, it has ceded that title to corporate America. As investors search for yield, corporate bonds are viewed as the darlings of the debt market, principally due to higher yields offered. As the demand for corporates grows, the spread in yields between corporates and U.S. Treasuries has narrowed, a further sign of the strength of the corporate bond market, thus encouraging more companies to issue debt. 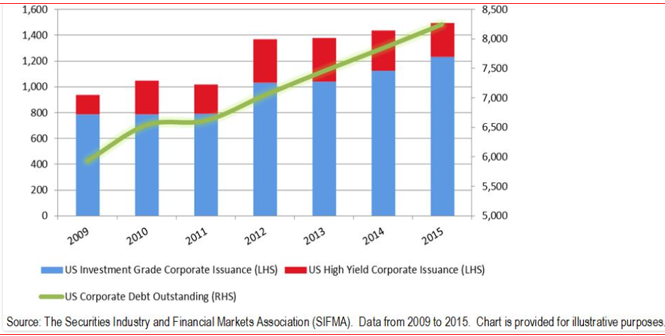 The rise in corporate debt is supplied mainly by investment-grade corporations i.e. from corporations with excellent credit ratings. 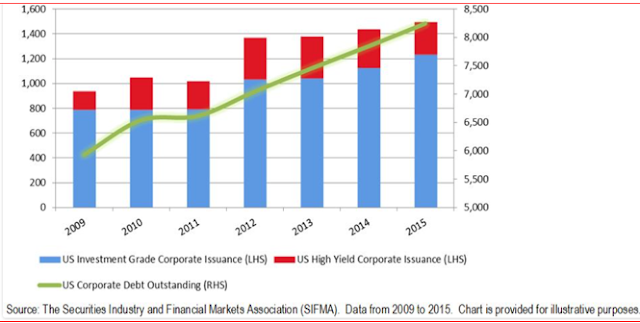 High yielding debt (so-called junk bonds) is not as responsible for the burst in corporate debt as is often portrayed in the media . Well-heeled corporations have turned to corporate debt, rather than issuing additional equity, to meet their business needs.What lies behind the surge in new corporate debt? Profits are inadequate to fund capital expenditures. Notwithstanding the fact that the stock market is reaching historic highs, corporate profits have steadily declined. The S&P 500 companies have experienced six straight quarters of declining profits. 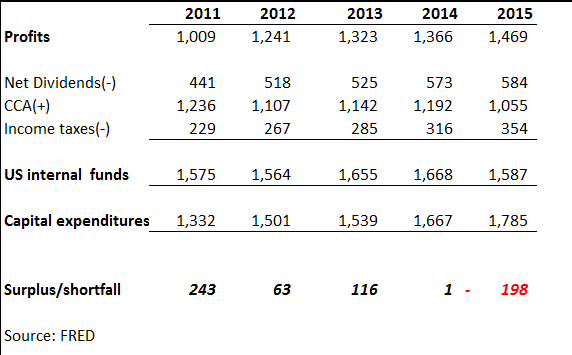 Table 1 connects profit growth with capital expenditures. To begin with, capital expenditures are, initially, funded from internal resources------- profits less dividends, less income taxes, plus accumulated capital cost allowances. From 2010 to 2013, U.S. non-financial corporations were able to fund business capital expenditures from internal resources. Since 2013 the sector has turned to the debt market to make up the shortfall, currently at approximately $200 billion. In and of itself, there is nothing inherently wrong with this approach, since it is vital to a company's long-term viability to increase and improve its capital investment. Raising debt to fund business investment, rather than raising equity, is an acceptable strategy to take, especially in this low interest rate environment. Pressure to Increase Dividends. Shareholders are pressuring corporations to increase dividends in the wake of falling yields on bonds. Now, investors are piling into dividend stocks to meet their long-term goals. Today, approximately 60 per cent of S&P companies generate a dividend yield--- the annual payout as a share of the market price---- that exceeds the yield on a 10 year Treasury bond. Historically, the relationship was just the opposite as investors looked to stocks to provide capital gains, not dividends, and to bonds to provide yields above the dividend rate. Rising Operating Costs. 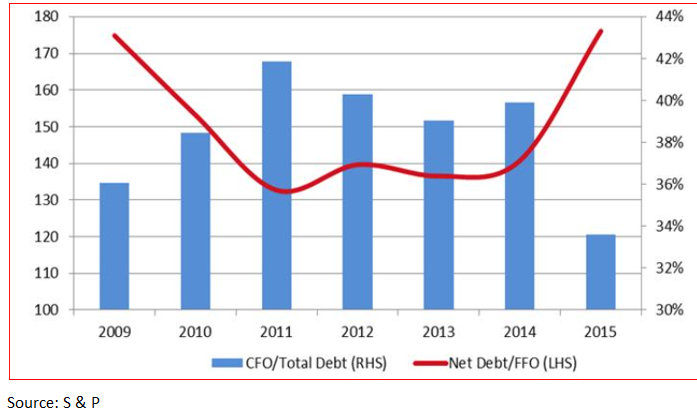 Debt issuance has soared while cash from operations has weakened, suggesting that many firms have turned to the debt market to help cover operating expenses. Chart 3 measures the rise in corporate debt against cash flow for the S&P 500 companies. The steeply sloped ratio of debt-to-free cash flow strongly suggests that corporate debt is being used to support daily operations. Corporate Stock Buybacks are all the Rage. U.S. corporations have conducted many experiments involving financial engineering. In response to the pressures to increase shareholder value, hundreds of U.S. corporations conduct continuous programs to buy their own shares in the open market. In some cases it is done to offset stock dilution created by employee stock options; in other cases firms consider buybacks as the highest and best use of corporate cash; and, in other instances, the maintenance of high stock prices leads to granting greater bonuses to top management. 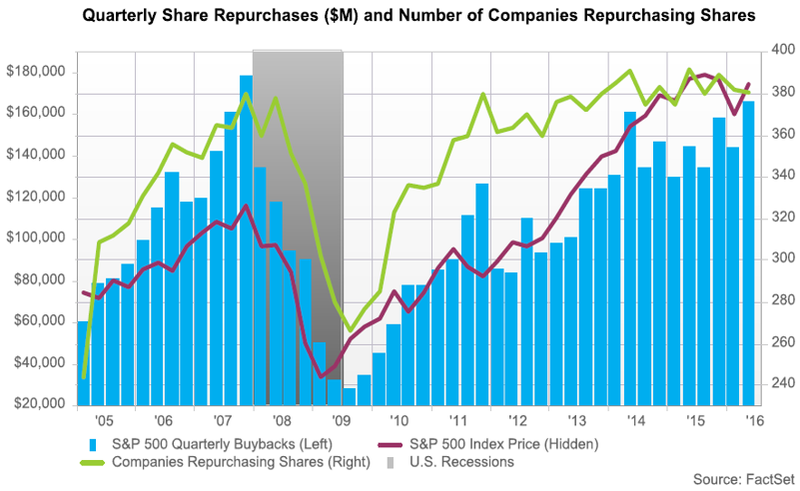 Whatever the reasons, the rise in corporate buybacks is quite dramatic (Chart 4). The extent of these programs can be measured in terms of both the total amounts--- $1.6 trillion ---and the breadth of companies conducting such programs---nearly 400-- so far in 2016. Both measures rival that experienced prior to 2008 and every indication is that this trend will continue. No matter how low interest rates get, it is hard to justify the raising of corporate debt to purchase outstanding stock. Longer term debt should be used for longer term needs, e.g. capital expenditures. But from a macroeconomic view, raising stock price does not figure in promoting economic growth or general well-being--- it is simply financial engineering serving the interest of only shareholders and management. No new jobs are created and no new capital investment is undertaken in a world of corporate buybacks. Investors are simply bribed with their own money. The Carlyle Group summarizes the use of corporate cash in Chart 5. 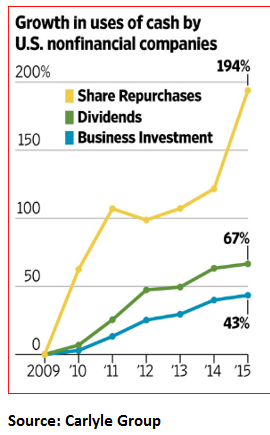 Since 2009, share buybacks have increased at enormous rate of 194% ; dividends have grown by 67%; and, business investment expanded a modest 43%. Rewarding shareholders with higher dividends and propping up share prices at the expense of investment in new plant, equipment and technology is a serious misallocation of resources at a time when the economy is experiencing slow growth and very poor productivity performance. It also represents serious short-sightedness on the part of management who feel so beholden to shareholders that they risk the longer term health of their companies.